The original marker for the 45×90 point in North America; the sign was later amended to explain that the real location is actually approximately 324 m (1,063 ft) behind and to the left of the marker on the ground. The best-known and most frequently visited such point is 45°0′0″N 90°0′0″W﻿ / ﻿45.00000°N 90.00000°W﻿ / 45.00000; -90.00000 which is located on land at 410 m (1,345 ft) above sea level in the town of Rietbrock, Wisconsin near the unincorporated community of Poniatowski. An incorrect geographic marker was placed there by the Marathon County Park Commission, but in 2017, it was removed and relocated to the actual location. It re-opened September 12, 2017. The point has become something of a pop culture phenomenon thanks to Gesicki's Tavern in the tiny cluster of establishments in Poniatowski. They once sold 45×90 T-shirts and registered visitors as members of the "45x90 Club". Since 2006, the Wausau/Central Wisconsin Convention & Visitors Bureau has been the holder of the official "45x90 Club" registration book. The book is on loan from the Gesicki family. Upon becoming a member of the "45x90 Club", the Wausau/Central Wisconsin Convention & Visitors Bureau will give new members a commemorative coin. 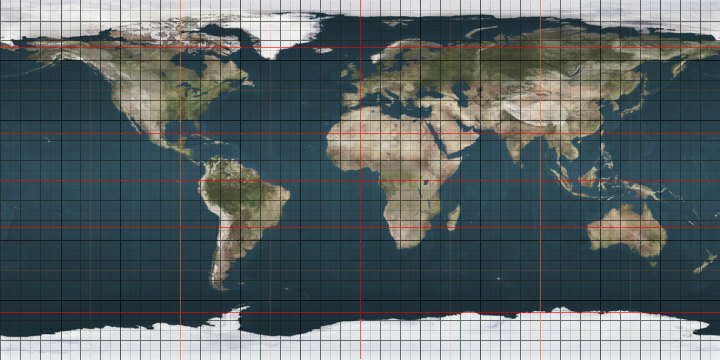 The only other 45×90 point located on land is 45°0′0″N 90°0′0″E﻿ / ﻿45.00000°N 90.00000°E﻿ / 45.00000; 90.00000 which has a height of 1,009 m (3,311 ft) above sea level and is located in a desolate region of the Xinjiang Uyghur Autonomous Region of China near the Mongolian border, some 240 km (150 mi) northeast of Ürümqi. Administratively, it is on the border of Qitai and Qinggil Counties. Greg Michaels, an American, and Ru Rong Zhao, a taxi driver from the closest town of Qitai, itself 110 km to the south-southwest, visited this point on April 13, 2004 and documented the visit on the Degree Confluence Project. Their visit shows that there is no monument or any physical sign that recognition has been given to this location. Possible debris from Malaysia Airlines Flight 370 (colored spots in lower left) were spotted by satellite near 45°S, 90°E. Located in the southern Indian Ocean, 45°0′0″S 90°0′0″E﻿ / ﻿45.00000°S 90.00000°E﻿ / -45.00000; 90.00000 has an ocean floor depth of 3,197 m (10,489 ft) below sea level and is 1,244 km (773 mi) southeast of the nearest uninhabited island of Île Saint-Paul, 1,480 km (920 mi) northeast of Elephant Spit on Heard Island, 1,569 km (975 mi) east north east of Port aux Français in the Kerguelen Islands, 2,425 km (1,507 mi) north of Antarctica, 2,448 km (1,521 mi) southwest of the closest inhabited land of Augusta, Western Australia, 4,080 km (2,535 mi) southeast of Réunion Island, and 5,550 km (3,450 mi) southeast of Benguerra Island, Mozambique, and 5,800 km (3,600 mi) southeast of Mossel Bay, South Africa. The antipode of the southern Indian Ocean location is the (45°N,90°W) location in Wisconsin. In March 2014, the location in the southern Indian Ocean was the subject of an aerial search for the missing Malaysia Airlines Flight 370, after potential debris were spotted by satellite centered on the 45°S, 90°E location. Located in the southern Pacific Ocean, 1,297 km (806 mi) west south west of Guaitecas in Chile, and 3,070 km (1,910 mi) north of Antarctica, 45°0′0″S 90°0′0″W﻿ / ﻿45.00000°S 90.00000°W﻿ / -45.00000; -90.00000 has an ocean floor depth of 4,180 m (13,730 ft) below sea level. The antipode of the southern Pacific Ocean location is the (45°N,90°E) location in China. ^ "45 X 90 Geographical Marker". Atlas Obscura. Retrieved 2017-11-04. ^ "Redirect Notice". images.google.com. Retrieved 2017-11-04. ^ a b Hart, Bill. "Gesicki, John Raymond". Marathon County Historical Society. Archived from the original on 4 March 2016. Retrieved 24 March 2014. ^ "Center of the Northwest Hemisphere". Attractions & Landmarks. City of Wausau, Wisconsin. Retrieved 24 March 2014. ^ "45°N 90°E". Degree Confluence Project. 13 April 2004. Retrieved 24 March 2014. ^ "Malaysia plane search: China checks new 'debris' image". BBC News. 22 March 2014. Retrieved 24 March 2014. ^ Murdoch, Lindsay (22 March 2014). "Missing Malaysia Airlines flight MH370: Floating debris spotted by Chinese satellite image". The Sydney Morning Herald. Retrieved 24 March 2014. This page was last edited on 14 January 2019, at 10:24 (UTC).